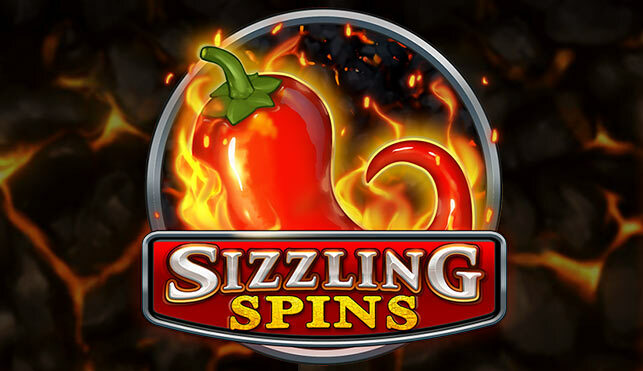 Play’n Go released a very cool new slot game today, Sizzling Spins. This new slot game uses a barbecue theme and come with 243 ways, which increase to 1024 ways in the free spins feature. Wild symbols may appear on all reels and the special pepper bonus symbol only appears on reels 1, 3 and 5. During normal spins one reel will light up. When a foil blocker appears on that reel, that symbol becomes wild. After this, that reel is held and you get a free re-spin. With a new reel that will light up. Each time a new foil blocker symbol appears on a light up reel, you get another re-spin and the wilds are held. If you get a wild symbol on all 5 reels all wins are doubled. If you get all three pepper symbols at the same time you will start the free spins feature. You will win between 8 and 12 free spins. During free spins you will play on 1024 ways. All foil blocker symbols are now already wild. The light up reel still appears and you will still receive free re-spins, just like above when the wild symbols lands on one of those reels. Each pepper symbol you collect during free spins will start increasing the multiplier. You will start at x1, but can increase it to x2, x3 and finally x5. You can’t win more free spins during this feature. Sizzling Spins is an amazing new slot game. Play’n Go is really pushing out some great games lately. This game is great. I have played it for a while and I love it. Especially the re-spins and the free spins feature are amazing. You can really win huge amounts on this game. Play Sizzling Spins at Thrills.